PhabrOmeter® system measures the “feels and looks”, or the so called “sensory perceptions”, of such sheet type fibrous products as woven and knitted fabrics, nonwovens, paper products, leathers and others for which such sensory properties are critical part of their performance. PhabrOmeter® instrument has become a designated instrument by AATCC standard for fabric hand evaluation. PhabrOmeter® system is an essential instrument for you to assess the sensory quality over such products as diapers, facial tissues, toilet papers, kitchen towels, surgical masks, etc. PhabrOmeter® system can help you select right fabrics to optimize the quality of your new fashion products. We build PhabrOmeter®, as the first step! PhabrOmeter® system can quickly demonstrate the influence of the chemicals on fabric hand, drape and wrinkle recovery. You can then fine-tune your products and produce high quality chemicals for textile industry. How PhabrOmeter® Data can work for you? Evaluation of Laundry Products - PhabrOmeter® is a powerful tool and can be used to measure the performance efficacy of laundry products (detergent or softener). 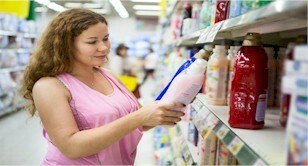 The data can help laundry products manufactures in R&D, QAQC and to improve their products. The following is an example of one of the sensory data - softness scores of different softeners. Remark - A larger softness score, a softer fabric. 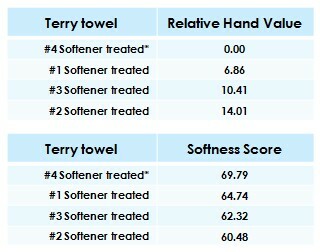 A normal type of cotton terry cloth used in above measurement; the treated terry towel did show significant reaction to the 4 different type of fabric softeners. Evaluation of wet baby wipes - We purchased 10 different baby wipes at Target and used PhabrOmeter to measure their softness score. 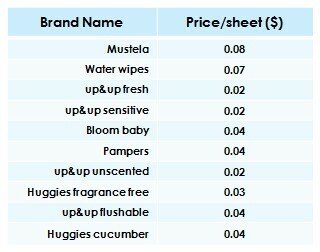 The results listed below shows that "Mustela" and "Water wipes" are on the top with the highest softness scores. Just for reference, we also have their prices below. 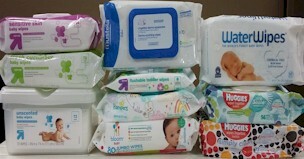 It shows that "Mustela" and "Water wipes" also standing on the top. This method is for the determination of an instrumental relative hand value (RHV) using the mechanical properties measured on a selected reference fabric and a comparable candidate fabric. A specimen is placed over a plate with a specified diameter opening through which a plunger forces the fabric specimen resulting in mechanical deformation data. 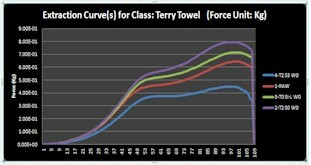 Force displacement curve data from a reference fabric and a test fabric are used in calculations to produce a Relative Hand Value (RHV). The PhabrOmeter® system offers clients the ultimate solutions for fabric sensory property	assessment and quality assurance and quality assurance. It is a powerful tool for improvement of your products including apparel fabrics, nonwoven, various paper and tissues, leathers and other fibrous sheet materials where sensory attributes are part of the product quality. Leather products - genuine and synthetic leathers. Cosmetic products - cream, lotion, moisturizer, facial masks.